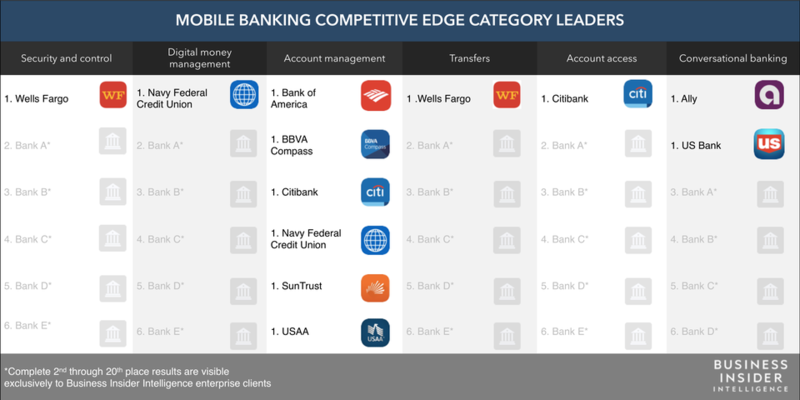 Business Insider Intelligence is announcing the banks with the most desirable mobile banking features in each category of our 2018 Mobile Banking Competitive Edge study. This announcement follows a previous note that examined the top five banks in terms of overall scores. To help banks attract customers with leading mobile banking features, our second annual Mobile Banking Competitive Edge study consulted heads of digital at top banks in selecting 33 in-demand mobile banking features - 11 of which were added this year - and ranked them based on how valuable 1,100 customers say they are. Using this ranking, we examined the offerings of the 20 largest banks and credit unions in the US to determine which banks are doing the best job of meeting customers' desires in mobile banking. Our study highlighted six important categories of features that are key for banks to differentiate on to attract customers: security and control, digital money management, account management, transfers, account access, and conversational banking. Each of the categories was weighted based on the percentage of consumers who said it would be "extremely valuable" if a bank offered the features in the category. Wells Fargo took first in the security and control section. The bank took the lead by supporting all six features in the category: the ability to turn a card on or off, travel alerts, the ability to dispute a transaction, letting customers view the status of disputes, the ability to order a replacement card, and the ability to use a phone in place of a card at an ATM. Title earned: "Most Desirable Mobile Banking Features for Security and Control"
NFCU led in the digital money management section. The credit union earned its top spot by providing four sought-after mobile banking features: the ability to view recurring charges, access to a financial wellness score, the ability to view spending within date ranges, and the ability to set spending limits on a credit or debit card. Title earned: "Most Desirable Mobile Banking Features for Digital Money Management"
Six banks tied for first in the account management section: Bank of America, BBVA Compass, Citibank, NFCU, SunTrust, and USAA. Each of these earned credit for all six mobile features in the category: the ability to set alerts, paperless statements, the ability to change the password in the mobile app, the ability to change a PIN in the mobile app, and the option to enroll in mobile banking without an existing online account. Title earned: "Most Desirable Mobile Banking Features for Account Management"
Wells Fargo led in the transfers section. The bank was alone in supporting all six features in the transfers section, giving its customers a wide range of money movement options. The bank edged out other category leaders by supporting two rare features: the ability to add bill payees with a photo, which only 10% of top banks support, and the ability to transfer funds to customers internationally, which only 30% of banks offer. Title earned: "Most Desirable Mobile Banking Features for Transfers"
Citibank beat the competition in the account access section. In addition to supporting tablestakes fingerprint scanning and facial recognition logins, Citibank provides customers with the ability to log in with a four- to six-digit PIN and an option to view account balances before logging in. Citi also earned credit for allowing customers to view accounts they own at other institutions within the bank's app, a feature only seven of the top 20 banks support. Title earned: "Most Desirable Mobile Banking Features for Account Access"
Ally and US Bank led in the conversational banking section. Both banks give their customers the ability to use voice commands to control the mobile banking app, the ability to converse with a chatbot in the bank app, and the option to bank through a smart speaker.  Title earned: "Most Desirable Mobile Banking Features for Conversational Banking"
Business Insider Intelligence's Mobile Banking Competitive Edge study ranks banks according to strength of their mobile offerings and offers analysis on what banks need to do to win and retain customers. The study is based on a September benchmark of what features the 20 top US banks offer, and a dedicated August 2018 study of 1,100 consumers on the importance of 33 cutting edge features in choosing a bank. 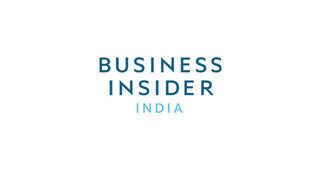 The full report will be available to Business Insider Intelligence enterprise clients in November. The Mobile Banking Competitive Edge study includes: Ally, Bank of America, BB&T, BBVA Compass, BMO Harris, Capital One, Chase, Citibank, Fifth Third, HSBC, KeyBank, Navy Federal Credit Union, PNC, Regions, SunTrust, TD, Union Bank, US Bank, USAA, and Wells Fargo. 3The CEO of Molson Coors says the market for cannabis-infused beverages could be worth billions. Here's why it's 'chasing down' that opportunity.